Create Your Very Own Clip-ins! 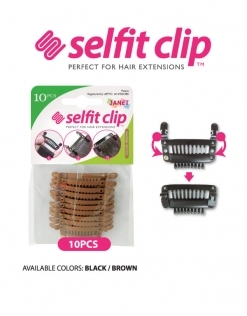 Our Janet Selfit Clips can be attached to any weft with our patented weft fixing hooks. Sewing is not necessary, but for a permanent clip-in style, sew the clips directly onto the hair weft. This product is great for those wanting to customize clip-ins to there own head dimensions.10 clips are in one pack and the available colors are black & brown. Perfect for hair extensions!